Alaska Native News Jun 11, 2018. A Piper PA-18 Supercub on floats on a flightseeing trip to the Katlian Bay and Olga Strait area crashed on Saturday night with one dead and one missing it was reported on Sunday. 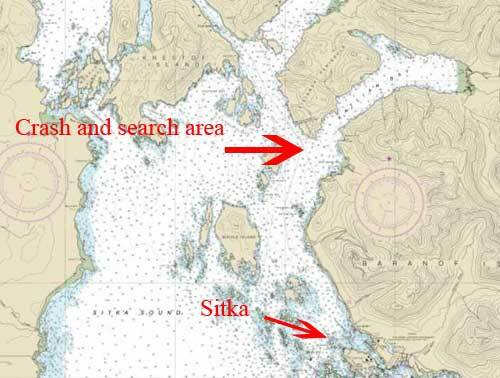 The flight that departed the Sitka seaplane docks at 7:15 pm on Saturday was scheduled for a 20-minute trip to the area north of Sitka but failed to return on Saturday night and was reported missing by the Juneau Flight Service Station. Coast Guard Air Station Sitka launched a Jayhawk helicopter crew to search the aircraft’s presumed flight path and the 154-foot CG cutter Bailey Barco also departed, arriving at the search location on Sunday morning. Alaska State Troopers, Alaska Air National Guard and Civil Air Patrol also assisted in the search that resulted in the discovery of the crash site at just before 11 pm on Sunday night. The aircraft was found partially submerged in a river near the mouth of Katlian Bay. Recovered were the remains of the pilot, identified as 45-year-old Stonie Huffman. The search for his passenger, 66-year-old California resident James Ronge, continued until he too was recovered on Monday. The National Transportation Safety Board will be investigating the crash.